Pharmaceutical Sciences is a dynamic and interdisciplinary field that aims to integrate fundamental principles of physical and organic chemistry, engineering, biochemistry, and biology to understand how to optimize delivery of drugs to the body and translate this integrated understanding into new and improved therapies against human disease. 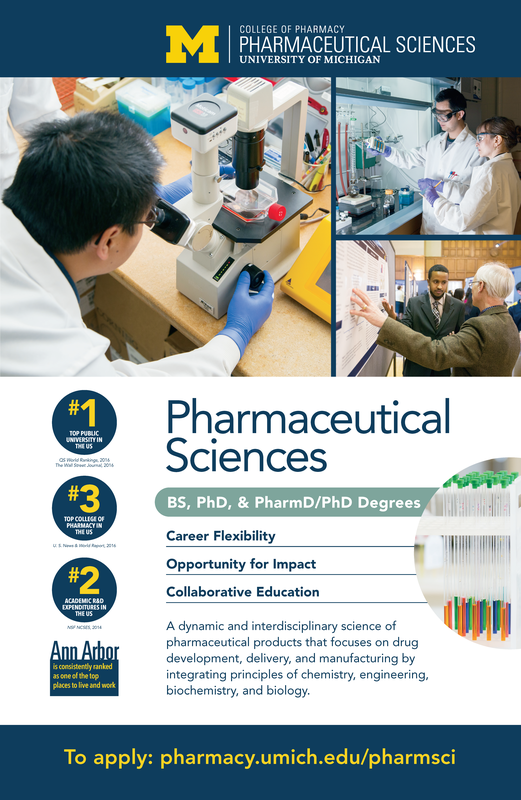 At the University of Michigan College of Pharmacy, our internationally recognized PharmSci faculty contribute to the field through inquiry into the underlying mechanisms of drug interactions with the human body and development of advanced synthetic or biologically-derived materials that can modulate these interactions in pursuit of better and safer therapies and drug products. Students in our department learn the common language of pharmaceutical sciences through the rigorous core course-work in biopharmaceutics, drug transport, pharmacokinetics & pharmacodynamics and drug delivery systems. In addition we support individualized student development by tailoring the electives curriculum to specific student interests in cell and molecular biology, synthetic and macromolecular chemistry, chemical and biomedical engineering, materials science, physiology and pharmacology. Armed with a strong, interest-tailored foundation in basic and applied sciences, our students are well-positioned to become an integral part of our explorations and our discoveries.